For nine decades and across several generations, our temple has served as a crossroads for families, friends, and spiritual teachers of the Buddha Dharma. 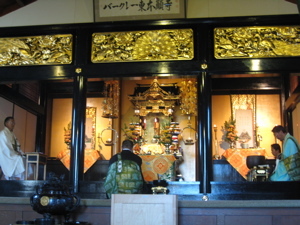 The Berkeley Higashi Honganji Temple, located in Berkeley, California, is affiliated with Shinshu Otani-ha, also called Higashi Honganji Temple, in Kyoto, Japan. Jodo Shinshu Buddhism, or “True Pure Land Buddhism,” sprung from the teachings of Shinran Shonin about 800 years ago. Jodo Shinshu is the largest sect of Buddhism in Japan and its first temples in the United States were established more than 100 years ago. In 2016, we celebrated the 90th year of our temple's founding. We welcome all who are interested to join us.